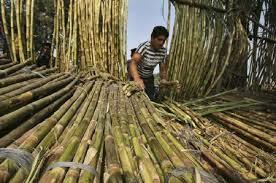 New Delhi: In order to improve the liquidity of sugar industry and support the cane farmers, the government will be coming up with a comprehensive package of more than Rs 8,000 crore, as per government sources to news agency ANI. The sources further said that the Government has implemented a series of interventions in the past four months to provide relief to the sugarcane farmers and to ensure clearance of their dues. These interventions include — increase in custom duty on import of sugar from 50 per cent to 100 per cent, removal of custom duty on export of sugar, imposition of reverse stock holding limits on sugar mills for the months of February and March 2018, allocation of mill-wise Minimum Indicative Export Quota (MIEQ) of 20 LMT and financial assistance at the rate of Rs 5.50/quintal of cane crushed amounting to about Rs 1,500 crore. The comprehensive package of more than Rs 8,000 crore will include creation of buffer stock of 30 LMT, for which the money will be transferred directly to the accounts of the sugarcane farmers. The creation of such a buffer stock will facilitate clearing of cane dues of the farmers and also ensure regular supply of sugar in the market by maintaining the demand and supply balance, the sources added. The cost of creation of the buffer stock, including carrying costs and other incidental charges, is estimated to be around Rs 1,200 crore. The government sources further said that the package will also include a major scheme worth more than Rs 4,400 crore for increasing the ethanol capacity in the country, which will help in diversion of sugarcane for production of ethanol in surplus season to facilitate timely payment of sugarcane dues to the farmers. The government is also understood to have decided a minimum price for sale of sugar at around Rs 29/kg, which will help clearance of sugarcane dues to the farmers. The sugar industry is an important agro-based industry that impacts the livelihood of about five crore sugarcane farmers and around five lakh workers directly employed in sugar mills. The sugar season of 2017-18 witnessed highest ever production of more than 315 LMT in the country, the sources stated, adding, the depressed global price of sugar and the surplus domestic production has however led to a decline in the market price of sugar, leading to accumulation of cane arrears of more than Rs 20,000 crores.